The decision in South Dakota v. Wayfair, Inc. ("Wayfair"), has encouraged California to expand its doing business determination for sales and use tax collection and filing obligations. Beginning April 1, 2019, where a retailer located outside of California meets certain thresholds, they are required to collect and remit sales and use tax. 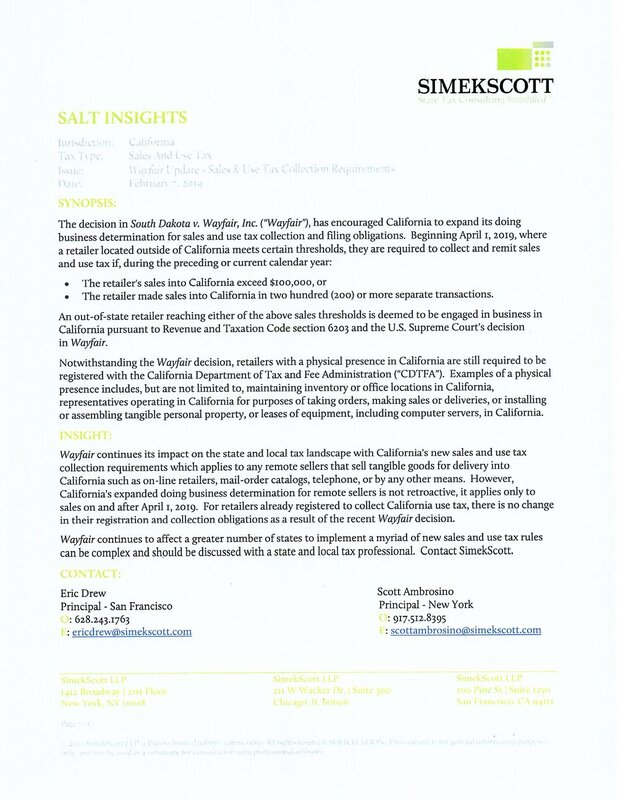 Wayfair continues its impact on the state and local tax landscape with California's new sales and use tax collection requirements which applies to any remote sellers that sell tangible goods for delivery into California such as on-line retailers, mail-order catalogs, telephone, or by any other means. However, California's expanded doing business determination for remote sellers is not retroactive, it applies only to sales on and after April 1, 2019. For retailers already registered to collect California use tax, there is no change in their registration and collection obligations as a result of the recent Wayfair decision.